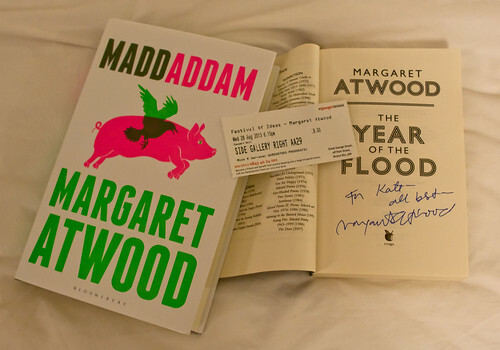 This is the third instalment in Atwood’s Maddaddam trilogy, following on from Oryx and Crake and The Year of the Flood, so this may review contain spoilers for the previous two books. Once again we are in a post-apocalyptic future that feels at once entirely alien and all too possible. Like the previous two books, this novel looks back to a pre-“flood” story, while also dealing with the post-flood present, but there is more of the present than there has been previously, because really here that’s the emphasis – is this the new way of things? Can humanity survive and if so, how? The pre-flood story that is slotted into the narrative is mostly about Zeb, who was a fairly minor character in The Year of the Flood but turns out to be an important link between everyone and everything else. However, this wasn’t clear at first and it seemed strange that the flashbacks should linger for so long on him. In particular, there’s an early episode about him having killed a bear that frankly dragged a bit. But once the pace of his back story picked up and some of the links to the wider story became clear, I did enjoy getting to see all the same events again from yet another fresh perspective. The post-flood story is less contemplative than it had been in the previous two books; in fact there’s quite a bit of action. The plague-surviving humans (a mix of God’s Gardeners and Maddaddamites) and the Crakers are learning to understand each other and co-exist, and this raises a lot of issues. Are the Crakers human – and indeed, what is the nature of humanity? Are culture and storytelling innate or taught? Can/should the humans protect the Crakers from bad stuff and teach them knowledge, or should their innocence be maintained as Crake intended? Are the Crakers the only hope for the future? One of the recurring scenes in this book is the Crakers’ story time. The Crakers insist on the daily ritual that Jimmy/Snowman began in Oryx and Crake, and though the storyteller now varies, the style is the same – a somewhat stilted, sanitised version of the truth. These sections are at first odd, irritating even, but gradually become familiar and often humorous, and finally they become the backbone of the whole novel. This was a satisfying end to the trilogy but it didn’t quite match up to the high point of The Year of the Flood for me. Source: Bought at an author event run as part of Bristol Festival of Ideas.